Prior to construction of Camp Andrews, the property was used for agriculture. Constructed prior to 1942, it was used as a rest and recreation (R&R) area for military personnel, both prior to and during World War II. There are lots of theories are out there about what Nānākuli means – several suggest it relates to looking at knees – others reference other body parts. To make up for this agricultural deficit, the coastal areas were rich in marine resources and there was always an abundant supply of fish. Accounts of early foreign observers give only a generalized picture of the late pre-contact/early historic patterns of population and activity within the Waiʻanae District and Nānākuli Ahupua‘a. Captain George Vancouver, sailing along the Waiʻanae Coast in 1793, noted: “The face of the country did not…promise an abundant supply (of water;) the situation was exposed.” He described the coast as “one barren rocky waste nearly destitute of verdure, cultivation or inhabitants”. In 1816, Boki was made governor of O‘ahu (and chief of the Waiʻanae district) and served in that capacity until 1829, when he sailed in search of sandalwood. In the mid-1800s, the back of Nānākuli Valley used primarily for ranching purposes and probably did not support permanent habitation. Tax records from the mid-1800s for coastal Nānākuli indicate that possibly as many as 50-people resided along the shore. The population in the area dropped precipitously during the 1800s, and in 1888, the Hawaiian Island Directory referenced only four residents of Nānākuli. O‘ahu Railway and Land Company’s Benjamin Dillingham, a prominent business man and developer, envisioned populating the western side of O‘ahu by introducing agriculture; however, the lack of water proved to be an obstacle until the discovery of artesian water solved the issue in the early 1880s. Dillingham saw that reliable transportation was needed to move crops from the west side of the island into Honolulu; he formed the O‘ahu Railway and Land Company (OR&L) in February 1889 and the rail stretched around Kaʻena Point as far as Kahuku by 1899. The families returned. In 1895, the Republic of Hawai‘i decided to open up lands for homesteading. The Dowsett-Galbraith ranch lease was set to expire in 1901, and the Hawaiian Government intended to auction off these lands to the highest bidder. There were two waves of homesteading on the Waiʻanae Coast. The first had more of an impact on Lualualei, while the second resulted in development of Nānākuli as a residential area. The early wave of homesteading passed by dry, barren Nānākuli; however, despite an insufficient water supply, Nānākuli was an attraction to some people: Because of its water shortage, parched Nānākuli had never attracted many residents. It remained a kiawe wilderness. Yet, the very fact that nobody wanted it turned the area into a kind of informal public park. Some came for the summer; others camped all year round. In 1916, Benjamin Zablan was appointed as Waiʻanae District Manager. He moved his family to Nānākuli and made his home on a beach stretch, now the stretch adjacent and south of Nānākuli Avenue. The southeastern end of this stretch was a safe swimming spot and was soon known as “Zablan’s Beach”. The beach was eventually named Nānākuli Beach, but local residents wished to give it a more specific name. In 1940, local residents petitioned the board of supervisors to name the park Kalanianaʻole, in honor of Prince Jonah Kūhiō Kalanianaʻole, the “father of the Hawaiian Homestead Act.” In recent years, Kalanianaʻole was combined with nearby Piliokahe Park to the south to form the Nānākuli Beach Park. In 1917, the US Government set aside land located where Nānāikapono Elementary School is presently located as ‘Camp Andrews.’ It was used as a rest and recreation (R&R) area for military personnel, both prior to and during World War II. The retreat at Camp Andrews consisted of cabins, cook house, a canteen, septic systems, a barber shop, armory, etc. The Navy acquired the property from the Army in 1952. All structures on the property were demolished. The Navy transferred the property to the State of Hawai‘i in 1962. World War II greatly affected the Waiʻanae coast. Military troops were sent in to train and practice maneuvers. Concrete bunkers and gun emplacements were built on the beaches and ridges, and barbed wire was strung along the beaches. After WWII ended, the lower portions of Nānākuli and Lualualei Valleys were further developed into residential lots after Chinn Ho bought the Waiʻanae Sugar Plantation. The image shows Nanakuli Valley (waianaecrider.) In addition, I have added other related images in a folder of like name in the Photos section on my Facebook and Google+ pages. The Waiʻanae Mountains, formed by volcanic eruptions nearly four-million years ago, have seen centuries of wind and rain, cutting huge valleys and sharp ridges into the extinct volcano. Mount Kaʻala, the highest peak on the island of Oʻahu, rises to 4,025 feet. Today, only a small remnant of the mountain’s original flat summit remains, surrounded by cliffs and narrow ridges. It’s often hidden by clouds. Mount Kaʻala is mentioned in Hawaiian mythology as a mountain that the goddess Hiʻiaka, the sister of Pele, climbed on her way back to the island of Hawai‘i from Kaua‘i. From there she saw the destruction that Pele, enraged over her long absence, created by causing a flow of lava over her lands in Puna. Kaʻala is the subject of several ʻŌlelo Noʻeau. “Ka ua Kolowao o Kaʻala. The Mountain-creeper rain of Kaʻala. Several ʻŌlelo No’eau speak of Kaiona, goddess of Kaʻala and the Waiʻanae Mountains. Ka wahine hele la o Kaiona, alualu wai li‘ulā o ke kaha pua ‘ōhai. The woman, Kaiona, who travels in the sunshine pursuing the mirage of the place where the ‘ōhai blossoms grow. Ke kaha ‘ōhai o Kaiona. Kaiona’s place where the ‘ōhai grows. He lokomaika‘i ka manu o Kaiona. Kind is the bird of Kaiona. Said of one who helps a lost person find his way home. Kaiona was known for her kindness and helpfulness. She rescued travelers who lost their way while crossing her mountain home by sending an ʻiwa bird to guide lost individuals to safety. This goddess was so beloved by Hawaiians that her name was given to Bernice Pauahi Bishop in mele that honor Pauahi. Most of the 1,100-acres of the state natural area reserve at Mount Kaʻala are made up of rugged terrain, including steep, inaccessible gulches. It ranges from wet forest at the top, to lowland dry forest. The Mount Kaʻala NAR protects Hawaiian plants and animals and ecosystems, most found only in Hawai`i, and some very rare. The only vehicle access is a controlled government road, while arduous ridge trails lead to the summit of Mt. Kaʻala. There, a boardwalk trail takes you on a walk through a native cloud forest. The boardwalk allows visitors to explore the misty flats of Kaʻala safely, and with a minimum of impact to the fragile plants and animals. Protection of Mt. Kaʻala Natural Area Reserve’s watershed forests by restoring native forest ecosystems is critical for maintaining the water supply of West and Central Oahu. Volunteers reintroduced the critically endangered kamakahala – with fewer than 100 individuals remaining in the wild – to its native habitat in the ridges of Mt. Kaʻala. 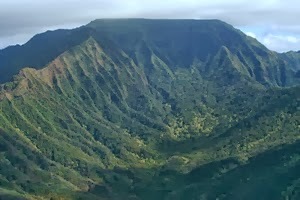 The image shows Mount Kaʻala (USGS.) I have added other images to a folder of like name in the Photos section on my Facebook and Google+ pages. 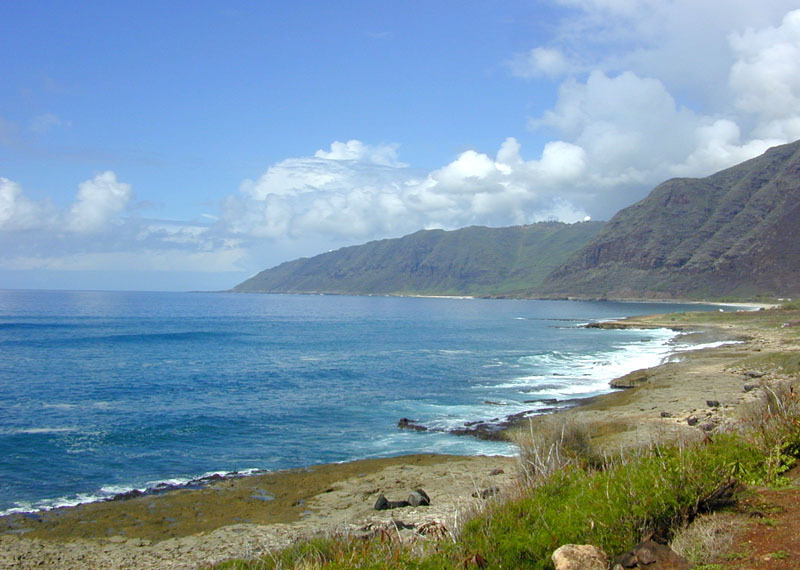 The Waianae Coast received its name from the mullet that was once farmed here. Wai means water, and ʻanae means large mullet (perhaps from mullet in the muliwai, or brackish-water pools, that were once common in the backshore on many Waiʻanae beaches.) These fish were once produced in large amounts. A legend describes the origins of niu (coconut) in the Hawaiian Islands, as well as the naming of Pōkaʻī Bay. Pōkaʻī was a voyaging chief of Kahiki (Tahiti) who is said to have brought coconut palms to Hawai‘i. A huge grove of coconuts once lined the shore of Pōka‘ī Bay. The trees provided shelter and useful materials for the ancient Hawaiian village. This grove, known as “Ka Uluniu o Pokai,” was not just a legend as it was noted by western sailors in the 1700s. Waiʻanae Ahupuaʻa within the Waiʻanae District was its Royal Center in the late-1600s to the 1700s. The ahupuaʻa had numerous important heiau and the largest population of the district at European contact. Prior to contact with the Hawaiian Islands by Captain James Cook in 1778, the population of Waiʻanae was approximately 4,000 to 6,000 people. The census in 1835 listed 1,654 residents on the Waiʻanae coast. In 1855, JW Makalena, the Waiʻanae tax collector, listed these figures for taxpayers: Waiʻanae Kai – 62, Kamaile – 44, Mākaha – 38, Makua – 21, Maile – 9, Nanakuli – 8. These were generally adult males. Assuming each adult male had a family of four, estimates of population are: Waiʻanae Kai – 250, Kamaile – 175, Makaha – 150, Makua – 85, Maili – 35, and Nanakuli – 30. Christian missionaries were quick to establish missions throughout Oʻahu following their arrival in 1820. Ordained in 1850, Stephen Waimalu became the first Hawaiian minister of Waiʻanae. Prior to the 1880s, the Waiʻanae coastline may not have undergone much alteration. The old coastal trail probably followed the natural contours of the local topography. With the introduction of horses, cattle and wagons in the nineteenth century, many of the coastal trails were widened and graded. However, sugar was to be the economic future of Hawaiʻi and with the passing of the treaty of reciprocity in 1876, allowing sugar into the United States duty free, the profits became enormous. In 1879 Judge Hermann A Wideman, GN Wilcox and AS Wilcox started the Waiʻanae Company to grow sugar in the Mākaha, Waiʻanae and Lualualei valleys. With the addition of a railroad for hauling cane, Waiʻanae Company carried the distinction of being the most modern and efficient in all of Hawai`i. As the success of sugar cultivation grew, so did Waiʻanae Village. By the 1890s, there was a resident postmaster, two mail deliveries a week, a steamer arrival every Friday and the plantation manager’s office boasted a telephone (McGrath). Eventually as the sugar lands increased, squabbles arose between the plantation and the taro farmers over the precious and limited water resources. Wells dug by the McCandless brothers solved the crises for the plantation for a while. At its peak, the plantation produced 13.79 tons of sugar per acre in 1935. John Papa ‘Ī‘ī describes a network of Leeward O‘ahu trails, which in early historic times crossed the Waiʻanae Range, allowing passage from Central O‘ahu through Pōhākea Pass and Kolekole Pass. The Pu‘u Kapolei trail gave access to the Waiʻanae district from Central O‘ahu, which evolved into the present day Farrington Highway. The arrival of WW II changed the character and land use of Waiʻanae. Some of the best sugar lands were taken over by the military, which was the beginning of the end for the Waiʻanae Plantation, that closed in 1947. Lots of information here from McGerty and Spear in City P&R. The image shows portion of the Waiʻanae coast line. In addition, I have included other related images in a folder of like name in the Photos section on my Facebook and Google+ pages.